Many times the best scenario for a company is not to have any interest in the system at all but simply to purchase the power from the system at a rate less than what they are paying currently. 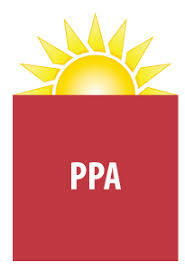 PPA Solar with No Upfront Investment: Non Profits and Commercial Businesses. • No Capital Cost or Upfront Cost . • Your PPA energy rate is locked in for 20-30 years. • Hardware owned by a third party. •Company has no interest in the operations and maintenance of the equipment. •Alpha Energy Management PPA option: owns, operates and sells the power to you . Many companies may not have the immediate ability to use the depreciation and tax incentives that comes with most renewable systems. And/or they may only want to “test the water” of renewables by not committing to a full lifetime of ownership. In this case energy system leasing is the best option. • Zero or Low upfront Costs. •Most of the time the Lessee will receive any utility rebates that may apply. Leasing company is able to use the tax incentives and depreciation to offset your monthly lease payment. • 5, 7 or 10 year leases can be structured to provide a longer term financing situation with a “buyout” at the end of the lease term if desired. •Most of the time the Lessee will receive any utility rebates that may apply. •At the end of the lease term in most situations the leasing company will either remove the system, offer a buy out, or do a lease extension! •You lock in your energy cost for the next 25-50 years. Companies that have the tax appetite and have the cash available will be able to take full advantage of the Federal ITC 30% Tax Credits and Accelerated Depreciation( 20-30% MACRS Depreciation) will enjoy the benefits. • Paid in full Cost-Free Energy for up to 30-50 years. Commercial property-assessed clean energy (CPACE) is a financing structure in which building owners borrow money for energy efficiency, renewable energy, or other projects and make repayments via an assessment on their property tax bill. • Provides Zero = No upfront Costs. • 5 to 30 years CPACE Loans can be structured to provide a longer term financing situation. • Repayment obligation transfers with ownership of property.